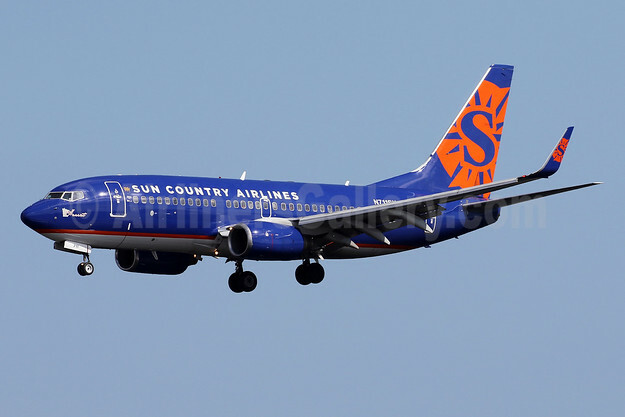 Sun Country Airlines has announced the addition of seven new routes to its growing network. Flights are available in time for the summer vacation season. With these new routes, Sun Country® offers a total of 50 nonstop routes throughout the year. In addition to these new routes, Sun Country is now offering new connecting service from its hometown of Minneapolis/St. Paul to two popular destinations in Mexico. Additionally, Sun Country announced new service to Myrtle Beach, South Carolina and Honolulu, Hawaii in December, 2017. Seasonal nonstop service between Minneapolis/St. Paul (MSP) and Myrtle Beach (MYR) is offered April 6 through June 4, operating twice weekly on Mondays and Fridays. Seasonal flights to Honolulu (HNL) are offered May 19 through August 19, operating four times a week, Friday through Monday, from Minneapolis/St. Paul (MSP) with connection via Los Angeles (LAX). Copyright Photo: Sun Country Airlines Boeing 737-73V WL N711SY (msn 30245) MIA (Brian McDonough). Image: 940870. This entry was posted in Sun Country Airlines and tagged Boeing 737-73V WL, msn 30245, N711SY, Sun Country Airlines on March 9, 2018 by Bruce Drum.